A nova is a sudden, short-lived brightening of an otherwise inconspicuous star. The outburst occurs when a white dwarf in a binary system erupts in an enormous thermonuclear explosion. Japanese amateur astronomers discovered Nova Cygni 2010 in an image taken at 19:08 UT on March 10 (4:08 a.m. Japan Standard Time, March 11). The erupting star (circled) was 10 times brighter than in an image taken several days earlier. The nova reached a peak brightness of magnitude 6.9, just below the threshold of naked-eye visibility. Credit: K. Nishiyama and F. Kabashima/H. Maehara, Kyoto Univ. A paper detailing the discovery will appear in the Aug. 13 edition of the journal Science. The story opened in Japan during the predawn hours of March 11, when amateur astronomers Koichi Nishiyama and Fujio Kabashima in Miyaki-cho, Saga Prefecture, imaged a dramatic change in the brightness of a star in the constellation Cygnus. 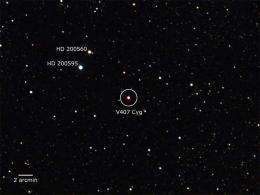 They realized that the star, known as V407 Cyg, was 10 times brighter than in an image they had taken three days earlier. The team relayed the nova discovery to Hiroyuki Maehara at Kyoto University, who notified astronomers around the world for follow-up observations. Before this notice became widely available, the outburst was independently reported by three other Japanese amateurs: Tadashi Kojima, Tsumagoi-mura Agatsuma-gun, Gunma prefecture; Kazuo Sakaniwa, Higashichikuma-gun, Nagano prefecture; and Akihiko Tago, Tsuyama-shi, Okayama prefecture. "This region is close to the galactic plane, which packs together many types of gamma-ray sources -- pulsars, supernova remnants, and others in our own galaxy, plus active galaxies beyond them," Donato said. "If the nova had occurred elsewhere in the sky, figuring out the connection would have been easier." The LAT team began a concerted effort to identify the mystery source over the following days. On March 17, the researchers decided to obtain a "target-of-opportunity" observation using NASA's Swift satellite -- only to find that Swift was already observing the same spot. V407 Cyg had to be it. The white dwarf intercepts and captures some of this gas, which accumulates on its surface. As the gas piles on for decades to centuries, it eventually becomes hot and dense enough to fuse into helium. This energy-producing process triggers a runaway reaction that explodes the accumulated gas. The white dwarf itself, however, remains intact. The blast created a hot, dense expanding shell called a shock front, composed of high-speed particles, ionized gas and magnetic fields. According to an early spectrum obtained by Christian Buil at Castanet Tolosan Observatory, France, the nova's shock wave expanded at 7 million miles per hour -- or nearly 1 percent the speed of light. "strange, I've just assumed for a long time that that's where gamma ray bursts came from"
GRBs are thought to be associated with the more energetic supernovae. When they occur, through core collapse or binary merger, a narrow beam of radiation is thought to be generated. When the beam lines up with the Earth, we see a gamma ray burst. It may be that some form of jet phenomena occurs in some nova and this burst (either directed towards us or not) was close enough and powerful enough to be detected by Fermi.